If expected cuts are made in January, halibut fishing could be over in the Bering Sea west of Alaska, the source of one-sixth of halibut caught in the United States. That catch includes most of the frozen supply that sustains restaurants, food-service companies and retail stores nationwide, such as Costco and Whole Foods. Those likely to suffer include fishing crews from Alaska to Oregon and vessel owners who invested in the halibut haul after it was privatized in 1995 in a failed bid to stabilize the fish stock. Perhaps more severely threatened are native Aleut villages of western Alaska that rely on halibut for both cash and sustenance. 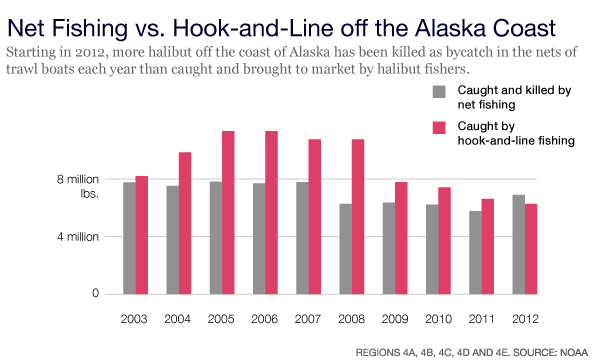 The trouble stems from more than a decade of declines in halibut stocks targeted by fishing vessels that use long lines of baited hooks to reel in the popular fish. 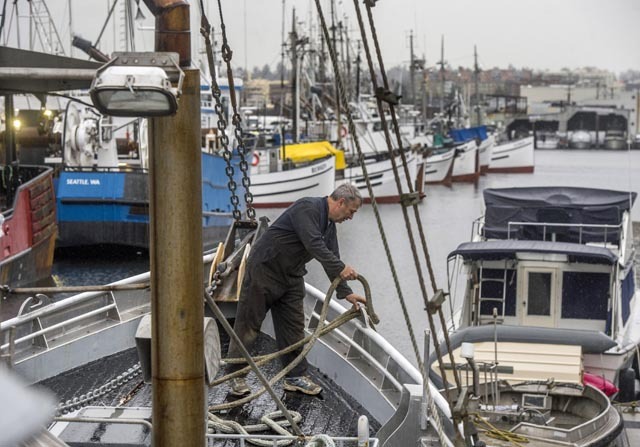 Pitted against the hook-and-line halibut fleet are 16 Bering Sea trawlers – controlled by five Washington-based companies – that scoop up sole, flounder and cod in nets mostly for export. Their nets also inadvertently kill halibut. The same goes for boats from America’s largest single fishery, the pollock that ends up in Filet-O-Fish sandwiches, fish sticks and fake crab for sushi. McDonald’s, Subway, Long John Silver’s, Gorton’s – all are dependent on the pollock. By the numbers, it’s a huge mismatch. The trawl boats, some as long as a football field, net 3.3 billion pounds annually and feed consumers around the globe. The smaller halibut boats return to dock with just 4.4 million pounds of fish. But that fish is sold mostly in North America and fetches far more, pound for pound, at the fish counter. It’s also a favorite of American diners. “It’s unusual to have that big steaky fish. It’s got that texture and the bright white meat and no bones, and all of those things that make halibut popular with people,” said Tyson Fick, communications director at the Alaska Seafood Marketing Institute. But landing that big steak-like fish and bringing it to American consumers is getting complicated. By law, only halibut caught by hook and line can be sold to consumers. Trawl boats are allowed to kill a certain amount of halibut in their nets as accidental catch, but all but a small amount funneled to food banks must be thrown overboard. The bargain struck on Americans’ behalf is that the trawlers net a seafood bounty that consumers can buy cheaply, or companies can export. In exchange, the massive net-fishers are allowed to throw back an amount of expensive halibut that is minuscule compared to the trawlers’ catch – but huge for the halibut fleet. Meanwhile, the hook-and-line vessels supply the U.S. halibut market. The system worked well when halibut was abundant. Now the fish is in steep decline and there is evidence that trawl boats are part of the problem. Temperature changes and past overfishing by hook-and-line boats are factors, too. But what’s clear is that since the catch was divided into private “shares” in 1995, an effort designed to make halibut fishing more sustainable, the amount of halibut scientists say is safe to harvest has fallen from 58 million pounds a year to a little more than one-quarter that amount. 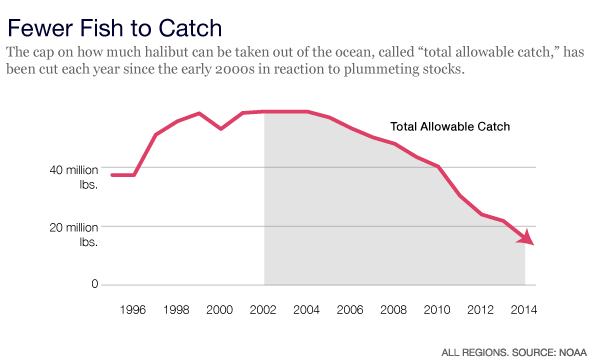 Large cutbacks in hook-and-line halibut fishing started in 2003. By 2012, the amount of halibut killed by the big trawlers – known as “bycatch” – began to outstrip the amount actually brought to shore by the smaller halibut boats. The cod, sole and flounder boats are chiefly responsible. At least 10 percent of bycatch is the fault of the pollock industry. Now the International Pacific Halibut Commission, a U.S.-Canada board, is poised to cut the halibut catch by 70 percent in January to control the stock’s freefall. It’s a stop-gap measure. The commission doesn’t have the authority to regulate the trawl boats. If the commission again reduces hook-and-line fishers’ catch, that would likely end halibut fishing in the Bering Sea. The reason: the allowable catch would be worth less than the cost to go to sea and bring it back. The Bering Sea halibut take is 16 percent of all U.S. halibut landings, but it’s a crucial slice. Because of accidents of history and geography, the Bering Sea fleet produces most of the frozen halibut that provide a year-round supply for high-end restaurants and retailers who thaw their supply, including Costco and Whole Foods. A closure could also drive prices even higher for fresh halibut from the other two U.S. sources, the Gulf of Alaska and the Pacific Ocean. Already halibut is one of the most costly items in the seafood case, sometimes hitting $28 a pound. It wasn’t supposed to be this way. Keeping halibut on the menu and halibut boats on the water is the job of two government agencies, the U.S.-Canada International Pacific Halibut Commission and an American panel, the North Pacific Fishery Management Council. When the international commission earlier this year slashed the halibut boats’ catch by one-third in the Bering Sea, it was counting on the American council, which regulates trawlers, to reduce the trawling boats’ allowable bycatch by the same amount. That didn’t happen. The council instead has called for voluntary cutbacks. Some council members argue voluntary measures get results faster in an environment where the pace of rule-making can be slow. But the American council typically avoids curtailing trawlers, reasoning that it makes no sense to reduce the pollock, cod, sole and flounder fisheries that are so economically valuable to protect the comparatively tiny landings of halibut and other smaller fisheries. A voting majority of the federal appointees serving on the American council tend to side with the trawl industry. Council service requires experience that draws much of its membership from the seafood industry, where trawlers are the bigger players. Trawlers’ representatives have said that they should not pay the price for the past mistakes of the international halibut commission, which previously allowed overharvesting. There is one public official who at least theoretically should be trying to bridge the gap and solve the problem – but he’s been mum on the issue. Jim Balsiger, administrator for the Alaska Region of the National Oceanic and Atmospheric Administration, serves on both the U.S. council and the Canada-U.S. halibut commission. He recused himself from voting and from discussion on halibut bycatch in October, citing conflicts of interest. His wife, Heather McCarty, is a lobbyist active in both trawl issues and for St. Paul, a halibut-fishing community on an island in the Bering Sea. Balsiger could not be reached for comment. One option to settle the dispute, according to Duncan Fields, a member of the American council, is to do away with the rule mandating that halibut be caught by hook and line. “It simply doesn’t make sense to have a law or a rule that every halibut that comes over the side of a trawl vessel is waste,” Fields said. “The American consumer doesn’t know or care that the halibut is caught by a longliner or a trawl boat… It’s poor public policy … to throw away about 8 million pounds of halibut” each year. Whatever new rules emerge, Fields argues, should acknowledge that halibut has become an iconic fish in America, and one in far greater demand by the American public than the cod, sole and flounder that account for more than half the halibut killed in the trawl fishery. As it stands, “We are exchanging something of great demand in the American public for a fish that is primarily exported and has little or no demand in America,” Fields said. What will happen if the international halibut commission goes ahead with further reductions in January, as expected? The halibut fleet could perhaps fish other species. Consumers could buy pollock or cod or some other white fish. But the small boat fishermen of Western Alaska – mostly Aleut natives – would struggle mightily. Some are based in communities whose economies turn entirely on seafood, with halibut and crab dominating the winter fishing months. Community leaders in St. Paul, for example, have said that the unemployment stemming from an end to halibut fishing would fuel social problems, and that many fishermen will face bankruptcy if they can’t return to the sea within a few seasons. Ending hook-and-line fishing of halibut in the Bering Sea also would sever the cultural ties between small-boat and small-community fishers and a fish that has had a long history in Western Alaska. Aleut natives, who harvest halibut for subsistence while fishing commercially, would face an unknown future. The same can be said for the halibut fleet. If you have experience with or information about the halibut fishery or the North Pacific Fishery Management Council, email lee@invw.org . InvestigateWest is a nonprofit investigative newsroom for the Pacific Northwest.